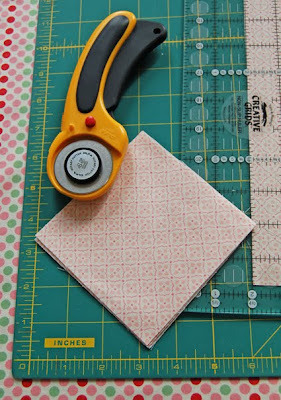 Gertie's New Blog for Better Sewing: Rotary Cutters: Yea or Nay? Rotary Cutters: Yea or Nay? So, I've never owned a rotary cutter and mat. But I'm deeply intrigued by them, and all the accessories that go along with them - the mats and gridded rulers and such. Rotary cutters look terribly efficient (and dare I say fun?) and like they would make such quick work of things like bias strips. Here's my dilemma, though: I wonder how useful they really are to the garment sewer beyond that. Quilters love rotary cutters for obvious reasons - you can speedily cut your squares or whatever it is you call them. (Please excuse my ignorance, quilters.) But are they really useful if you're just sewing garments? I've only seen one clothing construction book refer to rotary cutters: Built By Wendy's Sew U, which suggests using a rotary cutter to cut out multiples of a pattern at the same time. Which, unless you're starting a little sweat shop or something, doesn't seem like it would be all that necessary for the home sewer, right? Also, what about the mats? They're rather pricey, especially for the larger ones. And wouldn't you want a big-ish one for garment sewing so you wouldn't have to keep moving your mat around under your fabric? Clue me in, please. Is there any reason for me to add these pieces of equipment to my already overstuffed sewing space? What say you to the rotary cutter for garment sewing: yea or nay? I use a rotary cutter to cut out my patterns sometimes. It isn't essential, but it can make things go a bit quicker. I have a rotary cutter and smallish mat, and it's true you have to do a lot of sliding the mat around to get anything cut out. That said, when I had a cheap pair of sewing scissors and was cutting out everything on the floor, I found it helpful. Now that I have a nice shears and a table, I find it to be more troublesome for garments (which don't have all that many straight lines anyway!) I mostly use the mat for the more "crafty" sewing projects I do, pillows, aprons, pincushions, bags - smaller things made of mostly rectangles. If you're sewing 100% clothes, then I think you can skip the rotary with no loss, but it is helpful for the other stuff. I'm still cutting things out on my hands and knees on the living room floor, so you can probably guess whether or not I own a rotary cutter! I am so glad you posted this, I have been wondering the same thing! I am very new to sewing and have done an apron, a pillow, and a tote bag (and I have a half-finished skirt from a sewing class) so I jumped into a dress pattern that seemed easy enough... I think I cut it very crooked or SOMETHING because it did not come together the way it was meant to!! I think a rotary cutter will really help me. I'm not a good cutter and the dress had 3 skirt panels that probably would have been much easier to do with a rotary cutter. Anyway, I'm eager to hear what everyone says! I'm a quilter as well as a garment sewist, so it was a no-brainer to use my rotary cutter and mat for cutting out clothing. You would definitely want the largest size mat you could possibly afford, but a smaller sized cutter is nice for curves. The long rulers make cutting straight lines so easy and professional. If we take ourselves seriously as artists and crafts(wo)men, we need to invest in quality tools. Happy Friday, Gertie! I'm a quilter and garment sewer, and if you're not quilting, you really don't need a rotary cutter and mat, IMHO. Well, unless you're doing tons of bias strips (or patches for bound buttonholes), and then a set might come in handy, if you can get it when JoAnn has their half-price sale. I've never really used one. I have this amazing ability to slip with it and ruin what I am cutting. I have a mat, etc but I just prefer scissors. I use a rotary cutter for cutting out virtually all my garments. I got one of those big cutting tables from Hancock fabrics, and two of the larger cutting mats almost cover the table. Where the rotary cutter really shines is cutting out knits. The rotary cutter cuts without shifting things around, so it's easy to get a perfect edge. I hated pinning and cutting with a scissors (I got blisters on more than one occasion from cutting, and my hand would ache). Cutting is my least favorite step in sewing, so anything that makes it easier is a plus. A rotary cutter allows me to simply lay out my pattern, put down some pattern weights (ceramic tiles and large washers), then cut cut cut! Of course, to each his/her own - it's certainly a matter of preference. The only thing a rotary cutter doesn't work as well for is small details. I still have to go in and clip the last few threads of sharp corners with a scissors. I've also never really had a lot of luck with multiple layers - it's tricky to be sure you got through all the layers while still cutting accurately. It would probably work best with lightweight woven cottons - anything else would be tricky to even lay out straight in multiple layers. I have a 36" X 60" cutting table with mat and I cut out all my patterns with a rotary cutter. I can't imagine going back to scissors for this task unless I did not have the large cutting mat. I really like using a rotary cutter for making bias binding strips. I have had less success with cutting out whole garments - shears have seemed easier (maybe I need a bigger rotary cutter). Cutting mats come in table size-huge! I cut most all my garments with a rotary cutter and mat. I believe it's more accurate. Think of it-when you cut with scissors, you are lifting the fabric and pattern as you cut. With a rotary cutter, your pattern/fabric remain flat. It does take practice to rotary cut well though. Like Cupcake Goddess, I use my rotary cutters whenever I make bias strips. But, I have not found them helpful in cutting out patterns. I find that I have much greater control and go faster with scissors. One thing I often use my mat for though is adding seam allowances to patterns traced from Burda. I am pretty lazy and just free-hand the seam allowances, and having that grid printed on the mat really helps in drawing those allowances. My experience is that a rotary cutter is fine for cutting straight lines but I don't like using them on patterns because I can't get as precise a cut as I can using scissors. I can't get close enough without shaving off the edges of the patterns and since I like using then more than once I like to keep them as accurate as possible. I guess I could train myself to use a rotary, but why bother. I just purchased my first rotary cutter after YEARS of sewing without one - I tend to stick with my large Gingher shears, but decided to buy an Olfa cutter and large mat when I spotted them on super-sale at the store. They've definitely come in handy for long straight-ish cuts, such as side seams, waistbands, interfacing pieces... but I switch back and forth as one can't do precise detail work with a rotary cutter. Most manufacturers use a heavy duty rotary cutting knife (electric) when they cut multiple plys, but those are more precise than the everyday consumer rotary cutters. So far, I enjoy mine and it saves me time on the straight edges. I say yes, they are useful for bias, patches. And yes they are expensive, but you can get a 40% discount coupon in joann. I never used a rottary cutter, but I do think they can be helpful with cutting knits. I'm a quilter - not a clothing sewer so I mostly only use a rotary cutter. I once had to make multiple costumes for "The King and I" and found my rotary cutter to be a big time saver in cutting several pants patterns at once. When I cut curves with the rotary cutter, I go to a smaller blade to be more precise and think that would be helpful in fashion sewing. Yea, Yea yea yea yea YAY to rotary cutters! I prefer the spring loaded ones, where you just press down on them and they automatically spring back to the safety position when not in use. I use them for all my garments. I find them to be much faster and more accurate. I use pattern weights. If I find the fabric drifts at all under the cutter, just lift up and restart. I'm a total believer. I have three mats: one is 24 X 18, which I use mostly for when I'm cutting swatches. One is 36 by 54, which fits on my cutting table at home. The last is 36 by 72, which I house on my munga cutting table in the classroom/studio. I could not imagine life without my rotary cutters. Well, I am on the fence. I am working through an Alabama Studio Style project where the cut edges of the fabric are exposed on the outside of the garment. I can see where a rotary cutter is the way to go for such a project...especially on knit fabric. Any little imperfection in my cutting is blatantly obvious. And I also agree if your going to do a rotary cutter might as well get the biggest mat you can. I am thinking about getting one of those bias tape electric cutter machines. As I do love bias tape! I like to use a rotary cutter and big mat for cutting out garment pieces, but I don't do it all the time. It's definitely a helpful set-up for cutting bias tape, cuffs, collars, ties, bands, etc. I would recommend looking for the non-slip Omnigrid rulers. I think they call them "Omnigrip." I sew and quilt. I have had the mat and cutter. I don't like them. I actually like the motorized scissors better. I am a quilter, first and foremost, but I do use my rotary cutter and mat for patterns...this may be because I'm so used to them, but I find it pretty handy. I have a 36" x 36" mat, and they are quite expensive, so it might not be worth it for you...but I am in love with mine! Gingher just came out with a rotary cutter, too...it's on my list! I am SO in love with my rotary cutter we're planning a June wedding. Seriously, it makes cutting a breeze: nothing shifts, the edges are all smooth and clean. And it's FAST. YEA for rotary cutters! I switched to using rotary cutters and a mat to cut out my garments a few years ago, and it made a HUGE difference in how quickly, accurately, and pleasurably I can cut out garments. I hate the way the fabric comes UP off the surface when you use shears. I would definitely not go back, and I am a garment-only sewing person. I have to second the poster who mentioned cutting out silk. I used it to cut out my silk Sencha blouse and it came out perfect. I've used shears to cut silk before but inevitably something ends up looking wonky because the silk shifted. I can't weigh in from a sewists perspective, as I am not one. But from a Guerilla DIY'er's perspective? I LOVE my mat and rotary cutter. Just the other day I turned a pair of thrifted leather pants into my long-coveted pair of leather shorts with these tools. I adore 'em. I quilt and sew, so I have rotary cutters and mats. Bias tape is so easy that way, knits, strips of tricot interfacing for knit hems, etc. A more detailed pattern piece is a bit harder, but you can cut out the straighter lines, then finish with shears. Others are right, you are not lifting fabric off the surface, so it is not shifting. Get some on a half price sale, at least a 45 mm Olfa and a large mat. JoAnns. Hancocks, Hobby Lobby or online sellers may have some deals. Yes, I use them, especially with patterns without seam allowances. I think they are wonderful. You need the mat. I have bought an adjustable guide arm for mine. Lay the guide arm at the seamline and cut. Saves loads of time on tracing, your seam allowances are completely accurate, yada yada. Why have patterns without seam allowances? Well, some come that way, if you trace them, but what's extra good is that you can adjust them (1" down the sides of trousers or whatever) AND it makes pattern alteration much easier. I use it occasionally for bias strips, but normally for fabric. Oh, and get an extra one with a pinking blade! Quick (and retro) seam finishing. They are another helpful tool. Essential? well perhaps not, but they cut straight edges so nicely. I got mine with a 40% off Joanns coupon, as well as the mat. There is no reason to pay full price. I'm a quilter as well as a garment sewer and I have to tell you that I've never used the rotary cutter for clothes. Frankly, it's too easy to cut things that you don't mean to cut with it. And even with my small blade, it doesn't do curves easily. I'd rather have a pair of sharp scissors any day! I do use it a lot though.... for quilting. Wow, good thoughts everyone! Now tell me about these 40% off coupons at Joann. Do you have to leave near a Joann or can you get them online? We don't have any of these crafty chain stores in NYC. They both - Hancock and Joanne have good websites and the coupons are good online. I am a garment sewer who took up quilts when garment sewing fell out of favor. I like my rotary cutter for garments better than quilts because the fabric lays totally flat. martelli cutters and mats are the best in my opinion - they are designed for no slippage. A few months ago I bought a rotary and large mat (thank you Joann's 50% off sale) and I LOVE IT! I hate cutting out patterns, but using the rotary makes it so much faster and more accurate. As others have mentioned before fabrics like silk are much easier to cut out. I was disappointed in the quality of the blade on my rotary. I hadn't used it much before there seemed to be a dull spot, leaving the fabric attached every couple inches. Any suggestions on a brand of rotary cutters that work well? I agree with writer "mar" above. I use mine mainly for quilting, but that has taught me how efficient and accurate rotary cutters are and I pull them out for cutting binding, waistbands, etc in garment sewing. The thinner the strip the wonkier my scissor cut edge tends to be so I like the precision of the rotary blades. I couldn't live without rotary cutters (I have 3 different ones including a pinking one), my HUGE cutting table (that my Dad made for my Mom over 30 years ago), and my BIG mats but I still rely on scissors for those precision cuts. A friend of mine has bad carpal tunnel issues and the rotary cutter has made her sewing life much easier and less painful! Rotary cutters are the best. I got a super-huge mat from Joann's online with a 50% off coupon and it is big enough to cut all tops and bodices and most skirts (though not pants, not that I sew pants). I can rotate the mat around on the table to get easier angles for cutting, too. If I need more room, I put one of my smaller cutting mats next to it. I have rotary cutters in a few sizes (the teeny ones are good for tiny curves). I find I cut much faster and much more accurately, since the fabric doesn't lift off the cutting mat. I only use my shears for notches and tricky little corners or for cutting fabric that just MUST be pinned to a cardboard mat (like slippery silk). Also there are attachments for rotary cutters that let you auto-add seam allowances. So you can trace a Burda magazine pattern without having to add seam allowances to the pattern--the little attachment adds it as you cut. And David Page Coffin also highly recommends them in his Shirtmaking book--it's not just in Sew U.
I say yea. I use mine almost every time I sew -- garments and otherwise. the OLFA brand (which is high quality) is on sale at Jo-ann's this week -- 40% off, I believe. Gertie - after you join their mailing list (I think you can do this online, altho I signed up in a store), you can get their paper flyers mailed to you. They have 40% off coupons (with some exclusions) and are sent at least 1x a month. I believe the coupons work online, but you do pay shipping fees. As for rotary - I think it distorts less than having to slide the blade of a shear under the fabric. I use only the small blades (about the size of a quarter) for everything because it is more precise than the bigger ones if you go around curves and corners. The downside is that the blades dull quickly and have to be replaced. I've tried the sandpaper tool to resharpen and was unimpressed. I have shears and cutters and use both. I love my rotary cutter, too! I cut everything that I can out on the mat, and for me it causes less slipping, especially with shifty silk fabrics. I smooth out the fabric on the mat, lay out the pattern pieces and weight them down the pattern pieces with some little weights, and cut away. I love rotary cutters for knit fabrics! Whenever I use normal scissors I end up with uneven edges because the fabric stretches or shifts while I'm trying to cut it. I also love using them on long straight lines, because the cut is just so perfect and even. If you get one I would recommend going to an art store instead of the fabric store to buy the mat-- I got mine at Pearl Paints in Chinatown and it was a bit cheaper there! They are sharp. Duh. But I find them very useful, especially for getting a beautiful clean curved line on through multiple thicknesses of fabric. I love my rotary cutter! It makes quick and accurate work of cutting fabric. I prefer it to my normal scissors. I bought mine as a kit at a 50% off sale at my local fabric store. I can't imagine life without my rotary cutter and mat. I also have the huge table-size one - yeah, it's expensive but it lasts a ridiculously long time (10 years now?). Patterns are cut much more accurately and *so* much faster. I'd never go back to life without my rotary cutters. I love them! One day I'd love a big table that I could put a big mat on permanently, but for now, I use mine for cutting out small projects and trimming seam allowances etc. The best accessory I've found by far is this little cutting guide for the straight Olfa cutters. You just adjust it to whatever you want it to be and cut away. So if you need to add a seam allowance somewhere, you just move the little knob, tighten and cut away. It's really accurate and absurdly fast. I had to take 7 1/2" off of a circle skirt on a dress I just made. It would've taken forever for me to measure, cut and then my arc probably wouldn't have been as clean. It took about 2 minutes with the arm. Yea for wee gadgets that make life easier! Yea all the way to rotary cutting! THE BEST sewing investment I ever made was in a double pack of 23X70 OLFA cutting mats that have special hardware to keep them together(total area 46X140) and my rotary cutter. Not only is rotary cutting much more time efficient, but the pattern pieces are so perfect that when I go to sew them, everything lines up perfectly(YEA! if your a little on the OCD side!). I make corsets and it's soooo nice that everything lines up when I assemble the pieces. I have a medium sized rotary and really want to invest in a larger one for even more speedy cutting and a really small one for cutting corners perfectly. My rotary cutter came with a guide arm that makes cutting any size seam allowance a reason to sing and dance! I use my rotary for pretty much everything I do now. The great thing about the double mats is that you can take them apart to store them easily. I got them from trufitpatterns.com. If you ask for their "class & In-Home DVD price" they'll give you a significant discount on these items. Better yet, they offer a package deal of two 23X70 OLFA mats, a mid-sized rotary cutter and the guide arm for $115.00 and their maximum shipping price last I checked in December was $15.00. They also have lots of other great stuff like my beloved KAI scissors and velum paper rolls. I've been rotary cutting for about 2 years now and I'm totally hooked! I recently bought a rotary cutter because I wanted to make one of those awesome asymmetrical cardigan wraps and the thought of cutting out that big of a piece with my crap-tastic sheers made me tear a bit. I read on a site that they are best for knits so decided to give it a go. JoAnn Fabrics is always having 50% off their rotary gear so it was pretty cheap. My advice is, ruler, ruler, ruler, ruler. No really, you will drive yourself mad at first without one. Because at first, you will have a lot less control in cutting that you do with the trusty sheers you have. Anyways, it's a great way to cut bias as well and it's always fun to find a new sewing toy! At the suggestion of a fabric store employee, I purchased a pinking blade for my rotary cutter. It works so much easier than heavy, stiff pinking shears. Like many others commented, I use the 40% off coupons at JoAnn or Hancock, especially to stock up on blade multi-packs. Definite yea! I used to use the rotary cutter just for quilts and crafty stuff. Recently I tried it for cutting out knit tops, and it is great. Everything stays perfectly flat, no need for pins. It is very accurate and you don't end up pulling or stretching the fabric at all. I had left over rotary cutters from my quilting days (when back then 15 years ago I had an accident resulting in stitches for my finger) - I thought I wouldn't use them garment sewing - but they are a joy for both knits and light weight fabric. . . I upgraded with a killer coupon - to olfa with guards for the fingers. Yes, the mat is a pain to move around - bias strips are super easy - I go back and forth between projects - my stainless steel cutting table is in the garage so sometimes I still use shears but I do like the convenience of having it available for knits. Now, I'm deciding on a serger. . .
Hey, but what about the _feeling_ of shears cutting in silk? The anticipation, "this dress will be The Dress"? I don't think it would be the same with rotary cutters. I have a rotary cutter and small matching mat. I love my fiskar scissors to make garments. I've bought 4 : 3 big ones and a small one. One of them is for cutting patterns. Gertie, I believe if you sign up online, you'll receive emails with coupons to use either online or in-store for Joann's. Sometimes online has better sales anyways! I think Hancock Fabrics, does too... But really, a 40-50% coupon is totally worth it! Wow...I just wrote a post for my blog (which will go up later today) on my first experience with a rotary cutter which was last night! So with one day's experience - Love love love it. I used a super small one and the precision on the curves was superior to anything I would get with a scissors. Having said that, they still scare me quite a bit and fear cutting a finger off! If you need a self-healing mat large enough to cut out garments but can't/won't fork out the money for it, check out a home improvement store. The large plastic sheets that fit into ceilings to cover fluorescent lights are "self-healing" on the backside. They work great! And they are only about $5.00. ...wow, it seems I have been too naïve thinking a good pair of shears would do the job! I withdraw my previous comment, and I might give a rotary cutter a shot! Thanks Gertie, for elucidating this, and thanks to all the people commenting showing naïve little me differently! not just Yea, but HELL YEA! For knits especially, they are fantastic. I've used mine for years and while I use scissors on tight curves so as not to gouge the mat, I can't imagine life without it! Yes to rotary cutters! It is so much faster. I use only cans from the pantry, uh, I mean pattern weights; no pinning. I love not having to lift the fabric at all when cutting. Get the biggest mat you have room for (don't pay full price) and a small cutter. 45mm is standard, but it's harder to get around curves with that. I use a 28 mm. I use 2 rulers: an 18"x3", and a dressmaker type with a curve. You can match up the curve exactly and follow the ruler to cut, but I mostly use it as insurance against disaster by placing it on top of the pattern piece near the edge, and freehand the curves. I sometimes clip a finicky spot with scissors, but that is rare. I put off buying a rotary cutter, and thought there was no way I'd spend that much on a cutting mat but once I bought one I wondered how I lived without it. I don't just sew garments, I do a lot of crafts as well. I do use it to cut out garments but if something has a lot of little curves or is intricate it's hard to use it. It's better if you are cutting out pants, a skirt, or something with fairly straight lines. When I first started garment sewing, I was using my mom's wee cutting mat. After a few classes and a quilt I invested in the large cutting mat & never looked back. Since I'm a terminal clutz I'm always afraid I'm going to wreck the floor or our dining room table when I'm cuting. So, the large mat was a great investment for me. And, I just hide it behind a bookcase when I'm not using it. For the rotary cutter, I didn't start using one until I started quilting. Now, I use it for both garment & quilting. Obviously, I'm only using it on straight lines but with my shakey hands, its a tremendous help. I think the main rule for sewing is "Whatever works for you." And the large mat & a variety of cutting implements work for me. Rotary cutters can be awesome for cutting out many patterns. I second the other posters who said they are great for cutting out knits, they really are. I find a smaller rotary cutter and the biggest mat you can afford are the way to go for garment sewing usage. I also have a little arm that I can screw on to mine that can be used to add seam allowances. Since I use a lot of patterns from the Burda Style magazine, I find this little arm indispensable. its' good for multiple layers, saved my life when I did 5 bridesmaid dresses. But the knife gets dull really easily. I got my cutter, mat and ruler thing as a set when the fabric store had a 50% off sale, so all 3 cost me $30 I think. Its just a basic 12x18 mat and 6x12 ruler but I've used it for a quilt, bias strips, cutting any pattern piece that are straight and for cutting some curved pieces just because I find it quicker. Its handy to have about though I wouldn't have bought one at the time if I had not seen that sale because it is most definitely not necessary. I have had great success using a rotary cutter and mat in order to shorten hems (which is the number one sewing project around here). I would always use some kind of "guard" on one side of the fabric (like one uses with table saw) to protect the fabric I absolutely did not want to get cut no matter how clumsy I ended up behaving. I'll jump on the bandwagon for rotary cutters as well. I bought one (well, two actually, one for paper, one for fabric) after I had surgery on my wrist and found that cutting with scissors was painful, tiresome and inaccurate. oh how I adore the rotary cutter - it cuts down on my least favorite task of pinning pattern to fabric because you can use WAY less pins. I will speak a word of caution though - BE CAREFUL. You DO NOT want your fingers anywhere near the blade. Rotary cutters are SHARP. Like, Exacto knife sharp. I warn my boyfriend everytime I cut something, just so he can be prepared for an emergency room trip. I use a rotary cutter and mat for almost all my garment cutting. In order to be successful, you need to have a large flat surface and mats to fit. Much easier and more accurate than shears (although I have those too). I also use my rotary cutter and mat to cut multiples, like pajama pants. I can cut out 3 pairs at a time by stacking the fabrics, so it can be a real time saver in some circumstances. I LOVE my rotary cutter and use it for garment making...I do a lot of patchwork though. I purchased the biggest cutting mat that was offered and used a 50% off coupon to help offset the investment because yes, they are pricy. The self healing mats are the best, I've had mine for years. Just be careful with your finger placement...I've definitely nipped a few fingers and that is not cool! YEA! Like many others, I use it for pattern cutting. I have a 24"x36" mat that will fit most pattern pieces. I also find it VERY handy for cutting interfacing - collars, facings, cuffs. I find I can be MUCH more accurate with my rotary cutter than with scissors. If you have the room to lay out and store a big mat, than yes, yes, yes! I love my rotary cutter and mat. I only sew garments. It is wonderful for cutting out silk or other slippery fabrics. I have an assortment of high end scissors, including one, and I don't recall the type, that is meant for silks and slippery fabrics. The rotary is better, faster and easier. Of course you have to have a supply of blades on hand because they need to be sharp and those sharpeners do not work. It takes a bit of practice to get used to them, and I use a scissors for inside corners, but mostly I use my scissors, including my Kai professionals, for trimming. I use the old style Olfa because it fits the seam guide, of which I have a stockpiled a few. They are fabulous for adding sas to my Burdas as I cut, a further time saver and the old blades are great for cutting paper strips and patterns. So a resounding yes they are useful for a garment sewer. Definitely Yea! I started using a rotary cutter when burda patterns came in little plastic envelopes and didn't have seam allowances. (Boy, am I dating myself. This was even before I subscribed to the magazine) I used an attached arm to cut a consistent 5/8" seam allowance. It's not easy to find the adjustable arm anymore. This task was much easier with the large expensive cutting mat, so I bought that, too. I've been using a rotary cutter to cut out patterns ever since. I'm not sure I even remember how to cut out a pattern with scissors! Oh, and they make cutting knits a breeze especially since a lot of them do not like to be pinned, and a cutter is perfect with weights. I say YEA as well. But them when they go on the 40 or 50% sale, or get a kind fairy to do it for you. For example, my local JoAnn's is always having the sale. I still love my knofe-edge dressmakers shears, but I use the rotary cutters for cutting out long skirts :), bias strips, waistbands....etc. In answer to your question: you sign up for JoAnn's coupons and you receive them through email and in the mail. The coupons are specified for online use, in store use, or either and are often 40% off. I bought my mat, rotary cutter and ruler with coupons. I have a three piece mat which when put together form a surface as large as my dining room table. I have a large ruler with a lip that I use in conjunction with the mats. I use the rotary cutter for long edges. I have found it particularly useful for cutting felt and lots of tulle (yards and yards for my niece's Halloween costumes. For all other cutting, I use the mats with my Gingher shears. Hope this information is useful. Great discussion! I own one, but most of the time I forget I have it. Especially because I have the mat hidden behind a bookshelf so it's out of sight (and therefore out of mind, too). The last time I remember using it was to cut out a very slippery sheer fabric, which worked quite well as you're pressing down on the sheer fabric so it stays put, instead of lifting it up with scissors so it can slip. It's probably not essential, but now that I've remembered about mine, I'll probably drag it out for my next sheer/silk/slippery fabric project! You don't need them. They are nice to have for some projects, but you have much more control with scissors. I have a rotary cutter that I have tried to use many times but can't seem to get a nice clean cut with it..I usually get frustrated and revert to my shears, Only to drag it out again another day hoping that I will somehow master the art of the rotary. Maybe it's because I am left handed - but I have tried it with both hands and flipping the blade.....I guess I am just a sissor girl even though I really wish I was a rotary one. I use a rotary cutter in my garment sewing fairly often. I like to lay my patterns down on the fabric and slide my mat underneath. I have a pretty big mat and I still have to slide it around. It comes in real handy when you are cutting tiered skirts!! I use my rotary cutter all the time and I don't quilt, i.e. I pretty much only use it for cutting out pattern pieces. I also use my gridded ruler all the time, too. I just bought a BIG mat from Joann online and w/ a 50% off coupon, it was around $40 - not bad! The mat is big enough that I can lay out much larger pieces of fabric. The rotary cutter is nice and fast. That said, you can do perfectly fine without one! I love my rotary mat and cutter --- fantastic if you are making curtains, as well as garments, quilts and other stuff. I get my supplies at Atlantic Thread Supply, a sewing supply company. I also have a lot of good shears (thanks E-bay! ), including the 10" ginghers--now that makes a satisfying snip! It works really nicely for cutting leather -- even thick tooling leather, and that's what I bought it for. I find that I use it as often as I can for patterns. I find cutting and pinning patterns to the fabric to be the most tedious part of sewing except, perhaps when the fabric shifts away from the pattern as I cut it. I don't have to deal with any of these things if I use a rotary cutter and pattern weights. It is tricky to do sharp curves. I'll have to try others' recommendation of a small cutter for that. I started off just using one of those cheap cardboard mats, which is far less than ideal, but a good stop-gap if you want to try it before investing in a huge mat. Even though cardboard will dull the blade quicker, and sinking into the cardboard makes curves a bit more difficult, I think it would be less irritating than a small mat. Nay. I have one and found it missed spots like corners, tight turns, etc. Also, if you nick the blade at all, it will forevermore skip cutting threads. Then if you use it before changing the blade, the uncut threads will pull. My vote ... stick with scissors. I haven’t cut a garment using a pair of scissors in more than twelve years. I LOVE my rotary cutter, especially when cutting out gowns. Along with my other rulers, I have a 48” long metal ruler. I have a 3’ x 6’ cutting mat that stays on my work table all the time. My only regret is not buying my large cutting mat years ago; I used a smaller mat for years and had to reposition it as I cut. I purchased the mat online from a business that specializes in cutting mats. My scissors are used to cut tight curves. The rotary blades can be costly, but buy them in bulk when they are on sale. The mat lasts for years, so when you break down the investment into cost per use, it seems to be an easy decision. Factor in the time you save cutting out things and the cost become negligible. I mostly use mine for quilting, but it is unmatched for how easy it makes cutting bias strips. I've got the big mat and I couldnt' live without it. It's pefect for getting a perfectly straight cut at the hemline. And I often cut out waistband pieces using the mat rather than the pattern piece for better accurancy. Also, I often skip facings and finish ends with bias tape so the mat/cutter are invaluable for cutting bias strips. OMG! Do not make me go back to scissors! 95% of what I sew is clothing and the rest crafts. I DO NOT QUILT! I use my rotary cutter every day, every project. It just is so much easier to use than my Ginghers. I use a rotary cutter when I am cutting out my pattern. It seems to work well and it's great for me as I have some problems with my hand and cutting with scissors aggravates it. I just have an 18x24 mat and wish I did have a larger one, but it does pretty well for most of the patterns I have cut out so far. I have not read through every comment, so sorry if this has been asked and answered already, but with shears it is common practice to have one set for paper, and one set for fabric to ensure they remain sharper longer.Does the same rule apply to rotary cutters, as a few of the comments I have read seem to mix between the two? Rotary cutters I feel once you try them you don't want to go back. If you have a decent size mat its so nice to cut out fabric and patterns with a super quick super clean edge. It's amazing with knits and also for thick fabrics like fleece and faux fur. I highly recommend them. I do keep a small one for patterns separate from my larger fabric one. Just like shears you don't want to dull your nice fabric ones with paper. Oh gertie if you sign up to the joan's websites newsletter they often send 40% off coupons for their online store to your email. Hope that helps. I own both, and I find I prefer cutting garments with scissors and only straight pieces with the cutter, such as bias strip etc. Or very slippery fabrics. Plus, I feel I have more control over what I'm cutting. So far, the scissors have been precise enough for me. Make sure the mat doesn't smell. Some of them really give off an annoying (and I'm sure not very healthy) smell. I've always imagined they were better for straight lines than curvy ones, which there's no shortage of in garment sewing. Personally I don't like having a lot of unnecessary (for me, maybe not you) gadgets/tools, so my Gingher shears do the job just fine. But I also never make my own bias tape and I have no plans to ever quilt (ever). I never, ever use scissors to cut my garment pieces. The rotary cutter is so fast, and makes a much more even cut for me. I do use scissors to cut the tissue pieces out, but my poor shears are very neglected! I have a medium sized mat, and I do slide it around, which is less annoying than it sounds. I'm planning to buy a huge one so I can leave it on the cutting table all the time. Yay rotary cutters! I use them to cut everything I possibly can, including future clothing. You can find ones with a smaller blade, which is good for cutting smoothly around curves. Pinked blades are also very nice for those of us without a serger! Elan brand 'Miracle Mats' are self-healing and cheaper than Olfa. You probably will only find this brand at independent shops because of the distributor, so ask around! Nay, don't like mine. moving the mat around is a pain and it's hard (in my opinion, maybe I just need practice) to cut on the intricate curves and corners. well I do both garment sewing and quilting. When I quilt, I'm always trying to use my rotary cutter. I bought it for quilting. Now garment sewing, I've always used a good pair of shears. I love my rotary cutter and use it 98% of the time while cutting garments. I have two sizes and I find that I prefer the smaller one for cutting all the curves of my garments with ease. I was a scissors girl for about 30 ears, and in the last few years have switched completely to rotary cutters. I cut EVERYTHING with them. You need the biggest mat possible (if you have access to a shop counter size one, get it, otherwise a 60 x 30" one). I use a 45mm blade cutter for big things and a 25mm (1") cutter for smaller curves. I also have a point-cutter for notches. I find the rotary cutter much faster and more accurate than scissors. Bias binding is amazingly quick and accurate, but equally, so is everything else. Most of my dressmaking and fashion industry friends feel the same way. It takes a littel practise, but really, not too much. Most ly it's getting over the fear of something new and different. wow, thanks for posting this gertie! I always look at these but was unsure if they was more for quilters, now after hearing majority of comments being pro- rotary cutter i might have to jump on the bandwagon! Must be kismet because I just got a replacement blade for my medium sized rotary cutter today. Cutting is my least favorite part of sewing, and I get a little neurotic it, but using a rotary is so so so much easier. You need probably two sizes, though: one for longer lines, and a very small one for curves and details. The mats are expensive, and you do need to have a big one because moving the mat around is a bigger hassle than just staying with scissors. And be careful because the mats will warp if not kept completely flat, and whatever you do, DO NOT LEAVE A MAT IN YOUR CAR. ASK ME HOW I KNOW THIS... All in all, big thumbs up for rotary cutters. You'll never go back. I own a rotary cutter and use it from time to time for cutting straight lines. I have a large mat, but the thought of having to shuffle it around under fabric and patterns is too much for me. I don't think I am adept enough to cut around patterns on fabric with a rotary cutter, it just doesn't feel right to me. I have lovely scissors and I actually enjoy the cutting out process. I rather like the sound that the scissors make on the table as I cut. I have 'cutting out afternoons' where I cut as many things out as I can (until I get fed up). Also, in my humid climate the rotary blades go rusty in about a week. I guess the only thing I could suggest is to try one and see how you go. It might be perfect for you. i am a fan of rotary cutters. I use them to cut the sides of skirts, cut sashes and other straight lines, and of course to cut bias. Wow- I'm convinced! I get Jo-Ann coupons in the mail, but they are also in my Sunday paper regardless- but I suppose if you don't have any locally, that's out. I actually had mine sitting right here when I read this, as really have to go tomorrow: there are promo codes on them that you can use online- this week's is NER86, good through tomorrow: 40% off regular priced goods, excepting the biggest-ticket items (sewing machines, dress forms, etc). It doesn't say anything about excluding mats. I did pop over to JoAnn.com to see, when people talk about how expensive the biggest mats are, what ballpark that is- and 35x70 is already 40% off, so you couldn't use a coupon anyway since on sale. Definitely an investment, but always been curious about these. Thanks for bringing up the topic- cutting is my least-favorite part of sewing, and really intriguing what everyone had to say here. I've been cutting out my garments with rotary cutters, mats and pattern weights for the last 20 years. It is SOOOO much faster than pinning and cutting. I bought two 24x36 Olfa green mats and one 18x24 one. Use your Joann's 40% off coupons to buy one at a time. You don't have to buy the special clips to hold them together. A bit of masking tape on the underside works fine. Mostly, I keep the two big ones on my cutting table. If that is a bit too short, I add the smaller mat. I also take the smaller mat if I am sewing at a class or at a friend's house. You need to cut your pattern out first. You can't cut the paper pattern and the fabric at the same time or else the paper will rip. Washers from the hardware store or pieces of scrap metal (from the metal shop at work or school) are way cheaper than store-bought pattern weights. Oh wow, I was not aware that this many people still use scissors! I cut EVERYTHING with the rotary cutter. It is so much faster, more precise, more fun. I really thought everybody who sews more than once a year would have one. I HIGHLY recommend it! I just bought a small one last week but haven't used it yet. I've had a large self healing mat for a long time. I actually don't know why I bought it without the rotary cutter! Thanks for this post and all the comments. Now I'm really keen to try it out! I don't think I could live without my rotary cutter! I use it for almost anything, except for tight curves and for making notches in my fashion patterns. I was thinking about getting one of those tiny little rotary cutters so I can do tight turns with it, instead of having to switch to my scissors all the time. I waited until I had a 50% off coupon from Michaels and then I used it to buy my rotary mat. I agree, they are expensive! I have used a rotary cutting setup almost exclusively since I began sewing clothing (15 years ago). I honestly don't know how anyone cuts accurately using scissors with patterns pinned to the fabric. (I know people do it successfully, I just don't know HOW!) :) For me, the main advantage is accurate cutting. I have never quilted or cut more than 2 layers of fabric. My 2 cents: To make it worth it, you need a big cutting table, and a big mat to cover your entire table. I have the table & mat commonly sold at Jo-Ann's. I use a 28mm cutter. I feel that it's easier to go around tight curves and corners that way. I use 2" metal washers from the hardware store as weights. No pins. I find that the big thick gridded rulers difficult to use with my small rotary blade and the softer thicker cutting mat that I use. The thick ruler doesn't allow the blade to sink as far as it needs to for cutting. So I use a metal ruler as a guide for long straight lines. I don't think you "need" a rotary cutter and I don't know if it will speed up the process. It's more accurate but have you had problems with fit due to inaccurate cutting? If not, then I'd say just keep doing what you're doing. Does it not bother anyone else that Joanns has a 40% coupon mailed out every two weeks? It seems to me you really are never getting a deal. Everything is marked-up and overpriced to begin with. Ahh, but I digress. If you trace/mark your sewing seams prior to cutting, you don't need to worry about perfectly cut edges. But, I do see where the board is useful with bias strips, etc. I think it would depend on what types of projects you do and how often that you do them. I have never used a rotary cutter or mat. I have used electric scissors in the past and if you have a lot of cutting to do, like making multiples of something that is not too intricate they are useful. I contemplated buying a mat and rotary cutter but when I asked around to people that sewed, while the quilters said it is almost essential. For clothing makers, most said stick with scissors as it give you more control on where you are cutting, especially if you have a lot of intricate pattern pieces, but the rotary mat and cutter can be useful if you are designing and measuring pieces as you go. Gertie, sign up at Jo-Ann's website for their emailed sale notices and you'll receive the coupons by email. This discussion reminds me of an old Seinfeld routine about chopsticks. "I'll tell you what I like about Chinese people. They're hanging in there with the chopsticks,aren't they? You know they've seen the fork. They're staying with the sticks. I don't know how they missed it. Chinese farmer gets up, works in the field with a shovel all day. Shovel. Spoon. Come on. You're not plowing 40 acres with a couple of pool cues!" So yeah. There are people, God bless 'em, who no matter what, are going to be sticking with shears, even thought there's something that cuts better, faster and more accurately. I love my rotary cutter! I use it for cutting out patterns almost exclusively. I'm terrible with a scissors, but I get such clean cuts with the rotary. I even cut the curves with it. I do have the largest mat they sell and it was really worth the investment. I bought mine at Joann Fabrics, but Walmart carries the largest size for what the on sale price is at Joann. The gridded mat and clear large ruler are fantastic for quickly setting a pattern on the grainline. No more tricky measuring tapes! Or guessing if the tape is perpendicular to the selvage. I have a rotary cutter. I like it to a point. It seems to, at times, miss little threads in the fabric that I have to go over again. Even with a new blade. That being said, the rotary cutter definitely saves time when cutting out patterns. I use my rotary cutter mainly for corsetry. I find it doesn't get into some spaces (like armscyes) very well for garment sewing, so I just use scissors for those. But for corsets IMO nothing beats tagboard patterns, pattern weights, and a rotary cutter. I'm so glad you asked that. I, too, was intrigued with them. Before I really even thought about doing quilting (still haven't got into it! ), I got a mat (18" x 24", I think), a 45 rotary cutter, and a couple of those rulers. As you predict, I've used it for making bias tape (it does make the cutting quicker and easier), and I've made bunting triangles. I tried to cut pattern pieces, but without the ruler, it didn't really work. And what to do with the notches? Get the stuff, it's nice to have, but it's not necessary. I have a small diameter cutter and a large mat. As long as the wheel is new it makes cut outs speedy. Finally one day I said screw it and went rotary and I have not regretted it one bit. It's quick, it's easy and I don't have ragged little edges where my scissors slip or my hands shake. Not to mention I have the arthritis in my hands and cutters mean I can continue to cut out fabric even when my joints are flaring. I splurged and got a cutting table and table-sized mat from the fabric store when they were on sale one year. A bit pricey, but totally worth it. The table is just the right height, no stooping or straining and the big mat means I don't have to keep adjusting everything. I just lay it out and cut, zip zip zip. I use rotary cutters almost exclusively to cut everything out. With practice I've even gotten to a point where I can freehand quite a bit with the rotary cutter. To be fair though, I have one of the huge cutting mats (mine is 36x72 and I think the minimum you could use would be the 24x36) and a big table to put it on. Without those 2 things it can be awkward to use the rotary cutter. It's great though because there is little to no distortion of your fabric while cutting -- especially of slippery fabrics. It is also much, much, much faster than using scissors. Well I lot's been said already, but I picked up my first rotary cutter after about 15 years of sewing, I think it's added back years to my life. Get the biggest mat you can or just get one of those self healing deaks, mine is from Ikea. Really it is so much faster. Can't use it for everything but at the very least hems, skirts, sleeves waistbands.. all become so much more uniform. I can no longer imagine using shears to cut out a garment. I have the large mat and cutting table and an ergonomic rotary cutter. I love the whole set. One caution, be sure to close the cutter when you are done. The blade is so sharp that a mere brush of a finger against the expose balde can slice you. I always double check that I have snapped the blade back inwhen I out the cutter down. I use a rotary cutter and mat for cutting out EVERYTHING--way faster and more precise. Cutting is the part of sewing that I don't like, so this makes it much faster. Do get the largest mat you can fit on your table!! Yes to: Rotary cutter, Seamline foot extension, Huge matt, Fairchild metal rulers (straight & in various curves) & pinking blade. If you have TNT patterns in Oaktag, or you are cutting out Burda patterns and adding a SA, the seamline extension thing is sooo accurate. It allows you to easily choose whatever SA you want. I like the pinking blade for projects with polar fleece. I have done some cute kids things with zig-zag insets. I also like pinked SAs on some fabrics. A pinked seam allowance can have less bulk than a serged SA. Many bought clothes in the 50s and 60s had pinked seams. We just don't see it anymore....but on a fine silk (vintage lingerie comes to mind) a pinked seam can be much smoother. I pretty much always use my rotary cutter because it is so much more accurate, except maybe on wools (too heavy). I love my rotary cutter set. I really do not know how I managed without it. My cutting with scissors always ends up jagery and this solves my problem. Well worth the investment. I don't have a rotary cutter, but I recently bought a mat, and for my set up, it has been very helpful. I don't have a nice big cutting table, so I used to pin and cut my patterns on the carpet. Over and over, I would accidentally pin my pattern and fabric to the carpet! It was very frustrating. With the mat, this is no longer a problem. It's also helpful for making patterns. Very useful for quilting, I've never used it for garment sewing. I do about half quilting, half clothing. I never had a mat that was very large, so it never worked very well to have a large enough space to cut efficiently. I have a good pair of sewing shears, so they work better for cutting out patterns and larger pieces of fabric. I use both shears and rotary cutters. A large rotary cutter is very useful for long straights - binding, belts, straps as well as hems, cuffs and so on. But I also use a small rotary cutter freehand for curves. In general cutters are faster and make cleaner cuts than shears. By leaving the fabric flat there is no distortion and no pattern movement so you can use pattern weights instead of pins, and save even more time. A largish mat is a definite advantage! I absolutely have to have a rotary cutter and a very large cutting mat. It has made my life much simpler - though I do sometimes still use my scissors for arm holes etc .. It takes a while to get used to using the cutter for curved hems etc, but it for me it was worth it. Cut pieces lined up better and my seam allowances were much more accurate. I sew mostly kids clothing and I don't want to cut the pattern to the size I am using so I can use the pattern again when the child gets bigger or for another child. Can I use a rotary cutter if I am leaving the pattern intact to the biggest size while cutting a smaller size? I hope I'm making sense. DPC swears by them, and as a serious fan of his shitmaking book I had to give it a go. I have found them to be very dfficult to use accurately, and always end up slightly overshooting the cut. And yes, they are pretty expensive, what with the mat and all. But to be honest the rotary cutter could be 100% accurate and totally free, and you'd still have to prize the Singer 10 inch shears from my hands. They are gloriously heavy, and make the most wonderfully archic sound. im learning about sewing made a couple dresses and started reading the Built by Wendy book which is actually why i started my investigation. all the dresses ive made have had those long lines and i think i might give it a try. I really wanted to post a comment because someone mention "if Joanne fabrics is having they're 50% off sale" and well my stop right befpre this page was Joanne's checking out they're %40 off all sewing and quilting supplies. Owning an online scissor store and also selling KAI Rotary cutters, probably the safest,most ergonomic cutter, to quilting shops and other businesses throughout New England, I can tell you that rotary cutter are definitely popular with tailors,dressmakers and even marine canvas fabricators. A rotary cutter is also a good replacement for the finicky pinking shears when you purchase a pinking accessory blade. Just make sure you that you buy the rotary manufacturers replacement blades and not generic ones because they're sharper and last much longer. LOVE LOVE LOVE the large mat! It's worth every penny. BUT... not so much the rotary for garment construction. For large areas, you need the large rotary. For curves, the small and you still shears to make the diamond cuts for fabric alignment. So that is three tools to pick up and put down multiple times. The blades dull quickly, and are expensive to replace. Give me a good quality set of sheers! They last forever, and if I use them on the mat, they glide across the surface nicely, IMO, saving more time than the rotary! I have also looked at the AccuQuilt fabric cutting machine but it is expensive and adding the dies makes it even more so. Any comments from those who have experience with either of these two types of cutting devices. I am a quilter and using the manual rotary cutters has proven difficult with some arthritis in my hands. I love rotary cutters!! I own few of them...they make my life of cutting fabric so much easier!! Only thing is you need to change the blades quite often and i actually found is it better to separate the one you cut fine fabric such as silk and cotton/ denim. AND concentrate!! Once I was talking and cutting at the same time, i had my finger in front didn't realize till it had a deep cut.It cut very fast but injury happens very fast too. So heath and safety ladies and gentlemen!! For leatherwork, especially if you make belts or something else that uses long straight strips - a rotary cutter works SO INFINITELY MUCH better than that stupid Tandy thing that looks like a cross between a cap-pistol and a toy airplane. Full sheet of plywood, spread the hide out, C-clamp a piece of steel (preferable, but more expensive) or aluminum barstock or ruler on top of the hide, and cut along the edge of the barstock. For this you want the straight-line-handle kind of cutter - you cannot exert any downward force to cut heavy leather with the new "ergonomic" one. For fabric - If I were doing lots of bias strips or quilts out of newly purchased, whole pieces of cloth, probably yes. For curved pieces, it's going to take PRACTICE!! I've tried using one on fabric a couple times, and didn't much like it - but then, I don't do much silk or knits. I have a 24x36 mat and it's great. I make my own bias binding and LOVE the rotary cutter and mat for doing that. I haven't sewn in 20+ years...and it's a whole new ballgame! This information is very helpful. Okie doke. I'm going for the largest size mat, getting extra blades for the rotary cutter, and using a Joann's coupon. Thank you!